The Original L’Auberge Chez François Cookbook returns in a Classic Edition. Alsace-Lorraine has produced one of the world’s richest and most varied cuisines. It combines traditional French cooking with surprising and delicious ingredients. Nestled in the hills outside Washington D.C., the legendary L’Auberge Chez François exemplifies the very best of traditional Alsatian cooking. The restaurant’s enduring legacy of culinary excellence and warm service began with renowned chef Franҫois Haeringer more than sixty years ago and is now carried on by his equally celebrated son, Jacques. One of Open Table’s 100 Best Restaurants in America, a AAA four Diamond Award Winner and considered by Zagat to be “DC’s Best Classical French Restaurant”, L’Auberge Chez François has long been on everyone’s list of favorite French restaurants and is considered the best place in the area for romantic dining. It is known as a favored destination for politicians, celebrities, and people seeking to celebrate a special occasion, often returning year after year. Chef Jacques’ cooking demonstrations, wine dinners, and special events also make the restaurant a destination for culinary education and gathering place for food enthusiasts. The appetizer section offers a wide selection of delicately seasoned pates, as well as such delights as the Warm Roquefort and Apple Tart. Entrees feature fish, shellfish and a variety meats and game. Try the Rack of Lamb with a medley of fresh vegetables, or the Alsatian-style Sauerkraut with Sausage and Pork. Haeringer includes many superb side dishes and salads, such as Braised Red Cabbage, Spätzle, and Alsatian-style Tomato Salad. And who could resist resist Kugelhopf or an elegant Chocolate Soufflé for desert? 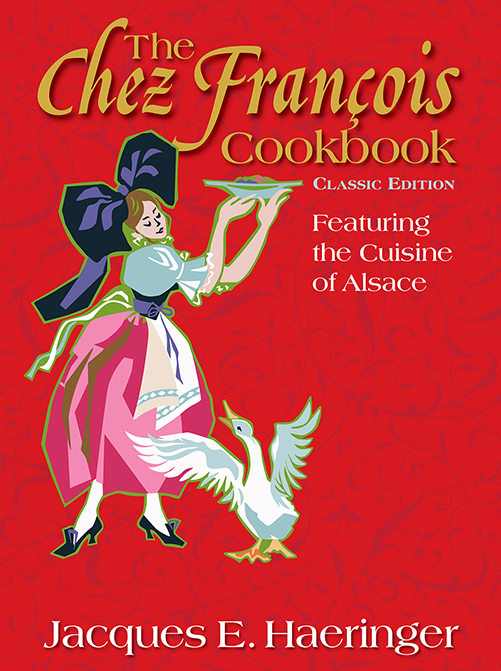 In this classic edition, founder François Haeringer reviewed all the recipes for accuracy, in keeping with his tradition of overseeing every aspect of preparation. Occasionally, a recipe was deemed too time consuming. In these cases, Jacques added a ” Monsieur François hint to the home cook” so that substitutions, variations and alternate techniques can facilitate cooking without sacrificing flavor. Jacques Haeringer is the Proprietor of L’Auberge Chez Franҫois. After graduating from Virginia Commonwealth University, and completing a culinary apprenticeship in Europe, he returned to Virginia to become chef de cuisine. When not in the kitchen, Chef Jacques can be found tending the extensive on-site vegetable gardens that provide much of the restaurant’s produce and inspire the dishes he serves. He is also the author of Two for Tonight: Pure Romance from Chez Francois and the Host of the companion PBS televison series, Two for Tonight.. Find out more at LaubergeChezFrancois.com.